(ISJM) On December 18, 2009, Greek Christians in the northern city of Ioannina united in an unprecedented demonstration against anti-Semitism and in recognition of the Jewish heritage of their city. As I wrote in July, the cemetery has been the repeated target of vandalism with three attacks this year. In recent years the municipality has also made attempts to assume control over parts of the cemetery property. According to Marcia Haddad Ikonomopoulis, the demonstration "was organized by the Christian citizens of the city and was heralded as a “a human chain against racism.” The cemetery was surrounded by the citizens of Ioannina to show their support for the Jewish community of the city and to publicly show their outrage at recent desecrations of Jewish tombstones." A public exhibition was also held to highlighted the ancient Jewish presence in Ioannina "and the importance of the Jewish cemetery as a monument to the long Jewish presence in Ioannina." The Jewish community of Ioannina was been the subject of a multi-media documentation project by Vincent Giordano, sponsored by ISJM. 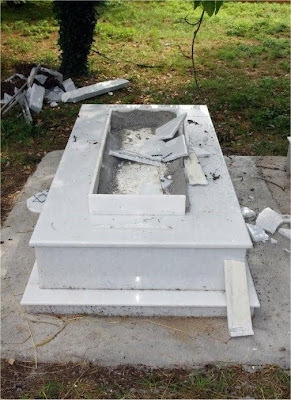 Marcia Haddad Ikonomopoulos, Museum Director at Kehila Kedosha Janina (New York) has previously provided this blog with an account of the cemetery's history. I was in the process of compiling a list of top ten stories for 2009 about Jewish heritage sties when news from Deutsche Presse Agentur (DPA) and the Associated Press that the government has pledged 20 million euro over the next 20 years – at a rate of 1 million euro a year – to help restore the neglected Jewish cemeteries throughout the country. There are about 70 known Jewish cemeteries in modern-day Austria, of which at least twenty the Jewish Community rates in poor condition. According to a report in the Associated Press, the Jewish Community will match the government grants through funds raised from private and local governmental sources. The decision to fund cemetery conservation and protection comes after nearly a decade of protracted and sometimes acrimonious negotiation about Austrian governmental responsibility for various types of compensation and support to Jewish survivors, the Jewish Community and Jewish heritage sites following the murder and destruction of the Holocaust. In 2001 Austria committed (as part of the so-called Washington agreement) to care for Jewish cemeteries as part of a compensation deal for Nazi crimes, but levels of care were not specified. Unlike Germany, which during the post-World War II reconstruction period (and ever since) has taken a strong official stance in the need for and appropriateness of government support for Jewish cultural and religious life, Austrian governments (and public opinion) steadfastly denied responsibility, portraying Austria as the first “victim” of Nazi aggression, rather than a willing collaborator in Germany’s war and the Holocaust. Thousands of Austrian Jews fled the country before and immediately after the annexation of Austria to Germany in 1938. In all, it is thought that about 65,000 Austrian Jews met their deaths as a result of the Nazi policies. Raimund Fastenbauer, secretary-general of the Jewish Community Vienna, told The Associated Press he hoped restoration work would begin next year. While in other countries in Europe local and national monument authorities have sometimes assisted in the care for particularly historic Jewish cemeteries, for the most part governments have spent little - and sometimes nothing - on the care of such sites. Even worse, in many countries of Eastern Europe disputes continue on the definition of what a cemetery is. For Jews, the presence of human remains denotes a cemetery - which remains a sacred space requiring demarcation and care. For many governments, and culture organizations, cemeteries are only recognized when gravestones are visible. In the case of at least several thousand Jewish cemeteries throughout Europe gravestones have been removed during times of persecution, expulsion, and genocide. Even in case where some gravestones remain, protected site status is often granted only to that small area of a cemetery rather than to the entire acreage where burials exist. Sometimes well-intentioned efforts to fence areas where stones remain results in the de facto sacrifice of more expansive cemetery areas. The Austrian Jewish Community web site has an extensive page listing all the cemeteries and giving their history, size, location, condition and notes on any current or recent restoration efforts. Lorca, Spain. Medieval Synagogue (15th century?) 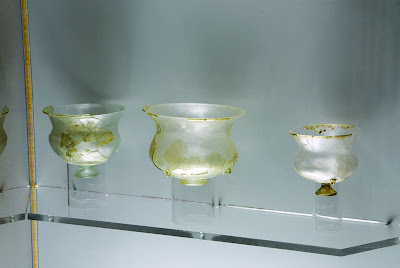 and three of the dozens of handing glass oil lamps excavated, as reconstructed. Photos: Samuel D. Gruber, 2009. A major conference about the archaeology of Judaism in Europe has been organized in Paris by Paul Salmona of the Institut national de recherches archéologiques préventives (INRAP). 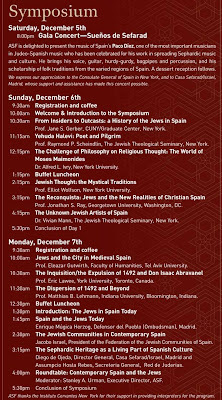 The conference will be held at the Musee d'art et d'histoire du judaisme on January 14-15, 2010. INRAP was founded in 2002 under the French Law on archaeology of January 2001. It replaces Association for the national archaeological excavations (AFAN), established in 1901. INRAP is administered jointly by the French Ministries of Culture and Research. The full program can be consulted at the INRAP website or downloaded here. Both conferences are signs of the quickening pace of “Jewish archaeology” in Europe, and the increasing variety of sites encountered, and conflicting views on their excavation, interpretation and presentation. The systematic and planned archaeology of Judaism in Europe is a relatively new phenomenon that has evolved from several trends that even today are not always easily reconciled. 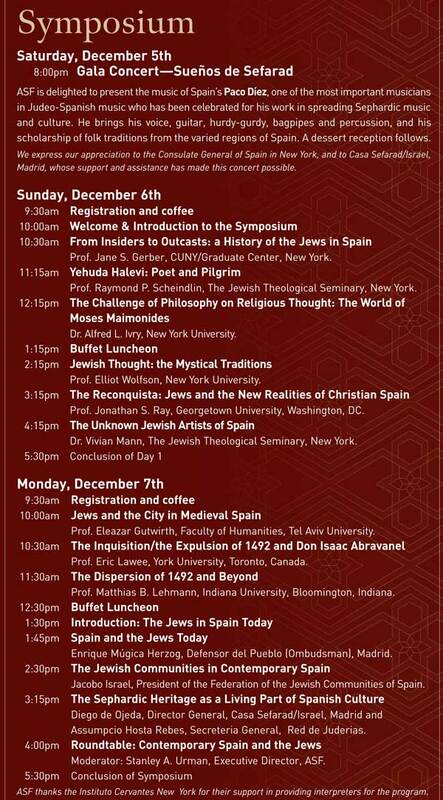 Since I will not be able to attend the Paris conference, and I doubt that many of readers will be there either, Ipresent here a brief overview of the topic of "Jewish Archaeology." The roots of “Jewish Archaeology” lie in the 19th and early 20th century German scientific study of Judaism (Wissenschaft des Judentum), an academic movement that advocated intensive study of ancient, medieval and post-medieval source material and created more nuanced history of Jewish settlement and community. The movement mostly saw traditional Judaism as an historic relic, rather than as a dynamic religion, and was thus rejected by most observant Jews. The Wissenschaft movement was particularly attentive to texts, but was also cognizant of the possibility of the new field of archaeology in providing new information. A similar movement developed in England, led by the Jewish Historical Society of England (founded 1893), that identified Jewish settlement sites in England from before the expulsion of 1290, and details about the names, occupations and wealth of many Jewish individuals. This effort has continued for more than a century and recently led to archaeological excavations in York, Guildford and London. Nearly contemporary with the Jewish Historical Society was the publication by Israel Abrahams (1858-1925) of Jewish Life in the Middle Ages, a work about the everyday life of Jews as much as about religion. It gave extensive coverage to material culture. Along with the development of “Biblical Archaeology” in the Near East, Jewish scholars supported excavations in Europe. Archaeological investigation into ancient Judaism was deliberately developed in the Holy Land, first by Europeans in the late 19th century. In the early 20th century Jews resident in Palestine supported this work, and continued after 1948 the new state of Israel. The Israel Exploration Society (originally Society for the Reclamation of Antiquities) was founded in 1914. Among many discoveries – that continue today – are the remains of synagogues and Jewish villages of late antiquity. Parallel to this, were accidental discoveries in Europe of signs of ancient and medieval Judaism in the form of inscriptions and synagogues. One of the earliest was the uncovering of the Jewish cemetery of the rue de la Harpe in Paris in 1847 (thanks to Max Polonovski for this information). In the second half of the 19th century Jewish scholars joined the study of texts and material culture by studying Jewish funerary epitaphs, including those from the catacombs in Rome, but also cemeteries dating from the 12th through 16th centuries in Worms, Prague, Vienna, Lvov and many other cities. In Palestine there was a growing interest and professionalism in “Jewish archaeology,” while in Europe there was growing evidence – but not widespread interest – in the potential of archaeology to expand historical horizons. Unfortunately, many finds explicitly linked to the European Jewish past have languished in storage and the potential link to Jews and Judaism of other finds have received little scrutiny. One of the few publicly accessible collections of medieval Judaica in Europe was that of the Musee Cluny in Paris, assembled in the mid-19th century by Joseph Isaac Strauss (1806-1888) who displayed 82 items at the Universal Exhibition in the Trocadero Palace in Paris and exhibited part of the collection at the Anglo-Jewish Historical Exhibition in London in 1887. The collection, which is mostly comprised of synagogue and household ritual objects was later purchased by Baron Nathaniel de Rothschild and presented it as a gift to the French nation. Archaeology of Judaism in Europe as we know it today developed directly out of the destruction of European cities in the Second World War. Post-war urban renewal developed opportunities for archaeological excavation in bombed out city centers. Documentation of standing Jewish structures – mostly synagogues – had begun in earnest in Germany and Poland during the interwar years, but most of these buildings were subsequently destroyed in the Holocaust. After 1945, however, remains of extensive medieval Jewish settlements in German cities could be fully exposed and investigated. These sites – previously known mostly through documentary evidence – gave a new physical dimension to the medieval presence in Europe. Unfortunately, limitations of archaeological technique as well as post-War political issues, financial constraints, and pressure for urban rebuilding, restricted the results of excavation and analysis. Otto Dopplefield’s work at Cologne was the most extensive; where he revealed the remains of a medieval synagogue that he dated to the 11th century. An impressive multistory mikveh (ritual bath), a monument of early medieval engineering was also revealed. New excavations carried out by the City of Cologne on the site since 2007 have confirmed much of Doppelfield’s analysis, but has conclusively pushed the date of synagogue and mikveh back to the Carolingian period and most likely – at least for the synagogue – to late antiquity. Other excavations took place in Worms and Speyer. The aftershocks of the destruction of Jewish communities in the Holocaust continued to influence Jewish scholarship in Europe. Two generations of scholars were lost – precisely those great teachers and their promising students who were most interested in the medieval Jewish past. Those that survived moved to American and Israel, far from the physical remains of European Jewish culture. Jewish medieval studies became again concerned almost totally with texts and movable objects. The methodology of the Center for Jewish Art at the Hebrew University, for example, emphasized iconography over physical context. Nowhere was there any planned effort to identify Jewish sites, nor to further exploit of the opportunities afford by unexpected finds. Throughout the Jewish world “Jewish archaeology” became almost synonymous with the uncovering of ancient Jewish remains, primarily in Israel, but also throughout the Mediterranean littoral, where a number of finds such as those from Ostia (Italy), Sardis (Turkey) and Stobi (Mecedonia) attested to Judaism’s widespread acceptance in the ancient world. Medieval archaeology itself as a serious discipline with its own rationale and developed methods continued to evolve, especially in Britain (where the influence of the “New Archaeology” was strongest), and in Germany and Italy. 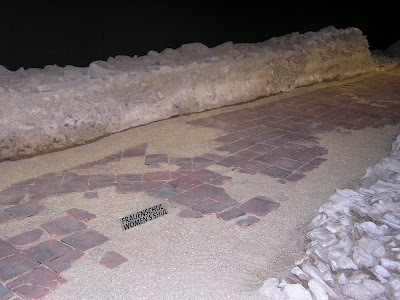 Many of the favored archaeological conceptions such as urban archaeology and regional settlement surveys that should have brought more attention to the medieval Jewish component, however, tended to ignore it completely. A close reading of the archaeological literature from Europe between 1960 and 1990 would suggest that Jews were hardly present on the continent – despite their ubiquity in religious, historical, and legal sources as well as historical toponyms in many countries. Thus historians and archaeologists have different perceptions of the place and role of Jewish in the European Middle Ages. From the 1960s through the 1990s most identification of Jewish materials in Europe was almost entirely accidental. The most spectacular instance was the discovery of a massive Romanesque structure in Rouen, France, in 1976, that may have been a synagogue, but was more likely a yeshiva (Talmudic school) and possibly a scriptorium. 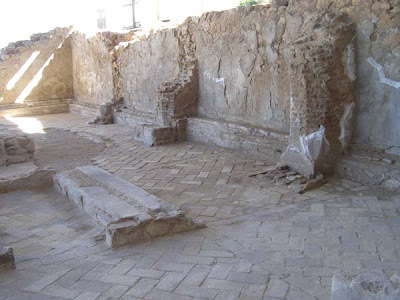 In 2002, excavations in Lorca, Spain uncovered the entire plan of a 15th-century synagogue as well as remains of eleven houses of the Jewish quarter, where previously no Jewish settlement was known. Houses contained distinctly Jewish features, including ceramic Hanukah oil lamps. The synagogue included original architectural and decorative features and fragments of more than 50 glass hanging lamps – previously only known from manuscript illuminations and later similar types from North Africa. Archaeology of Jewish sites has centered on religious and ritual sites. These were the most prominent structures of Jewish communities, especially synagogues and mikvot (ritual baths), building types that are also most likely to incorporate distinguishing features allowing them to be identified as Jewish. These structures have usually been found in the course of building renovation or construction, or as part of other excavations. Recently, as in Regensburg (Germany) and Vienna (Austria), large planned excavations have been carried out at sites where ancient synagogues were known have existed before they were deliberately demolished, and the remains of those buildings and adjacent structures have been exposed. Similar excavations have been advocated for other known sites, such as the medieval synagogue in Budapest. In Spain, a more sensitized archaeological profession is now more adept at identifying Jewish sites discovered by accident, and historians and archaeologists are also seeking Jewish remains. A rich array of documentary sources, as in Jaén, can help locate former Jewish settlements in towns and cities throughout Iberia, where medieval juderie are still remembered in local lore and toponyms. For centuries, traces of many Jewish cemeteries have been found, mostly sites which Jews were forced to abandon during periods of expulsion, or which were expropriated from them by authorities. Commonly, inscribed stone gravestones (matzevot), often in only fragmentary condition, have been found; mostly discovered in locations of re-use, incorporated in later structures, roads, city walls, river embankments, etc. where they served as ready building material. This is true in Spain, Italy, Germany and elsewhere in Europe. 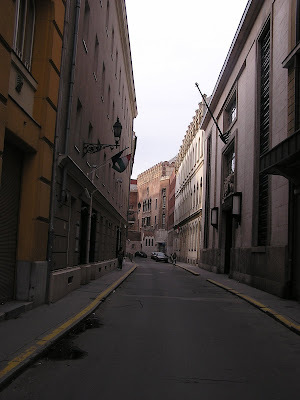 In a few cases, such as York (England), Prague (Czech Republic) and Lucera and Tarrega (Spain) previously forgotten and long unmarked Jewish cemeteries have been discovered in the course of urban development. In the past, such cemeteries might have been entirely destroyed without careful examination. Now, such finds are usually reported to cultural heritage authorities and they are carefully excavated by trained archaeologists. In some cases their Jewish character has been perceived when excavations began, but archaeologists did not consult with present-day Jewish communities. 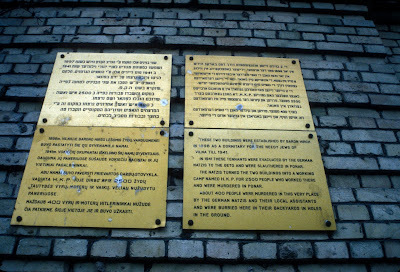 In almost all cases when the burials were identified as Jewish – either before or after excavation – some Jewish organizations, especially representative of Jewish religious communities, have protested the excavation and especially the exhumation of human remains as a violation of Jewish religious practice and law. In cases where the location of medieval Jewish cemeteries is known, Jewish communities have generally encouraged non-intrusive archaeological methods as a means of investigation. Jewish communities and archaeologists are still developing procedures to lessen conflict over cemeteries. So far, in some places, there seem to be irreconcilable differences of opinion and approach. Maribor, Slovenia. 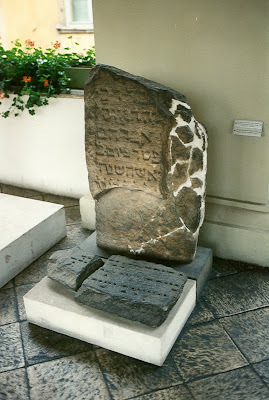 Fragments of medieval Jewish gravestones now in Municipal Museum. Medieval treasures have been uncovered, mostly as accidental discoveries. The two most famous medieval treasure “hoards” are those of Colmar, discovered in 1863 and one from Erfurt found only in 1996. These hoards of money and precious objects were probably hidden in time of persecution and mass murder of Jews, and not recovered. The Colmar treasure contained an elaborate early 14th century wedding ring. Nothing is known of the individuals or groups who hid the treasures other than their apparent wealth, but it is assumed that they died in the massacres of 1348. Similar accidental discoveries of caches of documents and many artifacts of everyday life have been found in genizot, (plural of genizah), storage spaces in synagogues used for discarded texts and ritual items. But with the exception of the famous Genizah of the Ben Ezra Synagogue in Cairo, whose documents have helped rewrite the Jewish and economic history of the Mediterranean region in the Early Middle Ages, these genizot have produced materials only from the 18th century on. In the case of genizot, after a series of accidental discoveries in the 1980s an 1990s in former synagogue south German synagogue buildings, more systematic investigations have been undertaken. Note: The above text is adapted from two larger articles on “Jewish Archaeology” in press and preparation. I always appreciate new information – historic or contemporary – about all types of investigation of Jewish heritage sites. 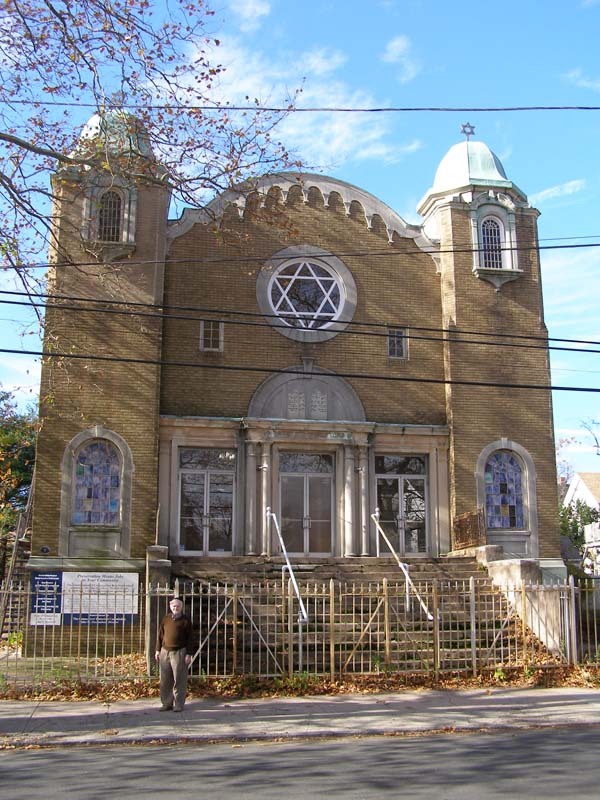 Its obvious that synagogues are more than just buildings. 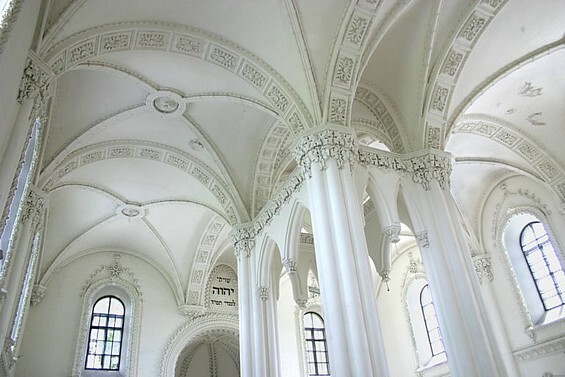 Even synagogue architecture is best appreciated – at least by men - when we see the space in use, or perhaps better yet – use it ourselves. 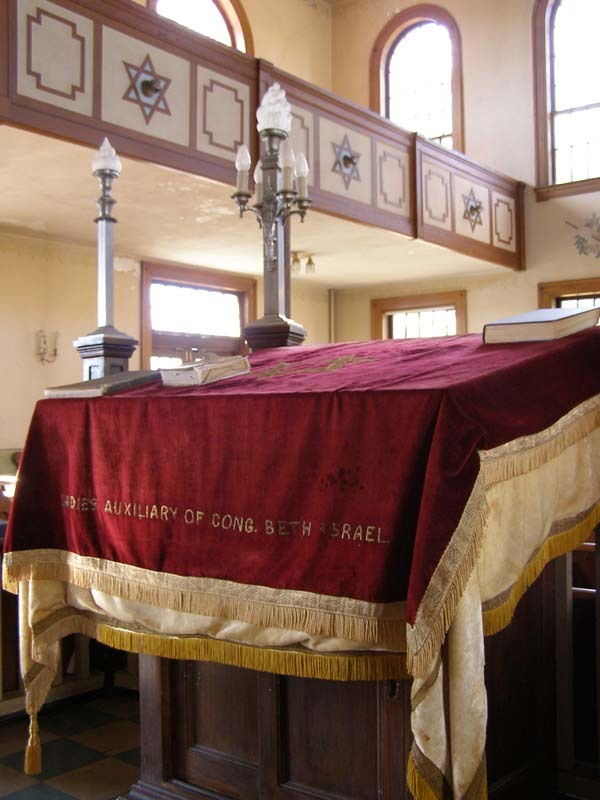 A synagogue space needs people, movement, prayer; and also music. For a medieval synagogue this might be solitary chant, or a holiday melody. 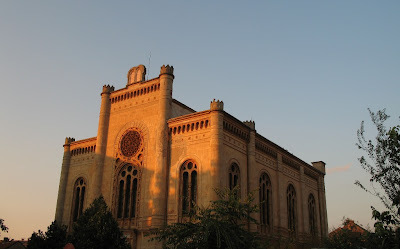 For a 19th century synagogue, especially on in Central Europe, this might be specially composed cantorial music, old prayers set to new melodies, and sometimes a mixed choir (men and women) and an organ. 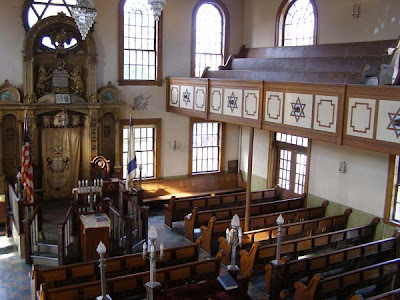 We can still get the feel and the sound of 19th century synagogue music in a few synagogues in Europe and America that have retained their older customs, or revive them occasionally for certain ceremonies. For most Central and Eastern European synagogues, however, even when the building survives (in part, or as a ruin, or adapted to a new use), the music has died, lost with the communities for which it was written. A remarkable exception to this rule is the impressive Romanian Neolog synagogue of Carei, built in 1871, and situated in the country’s Hungarian speaking northwest, near the Hungarian border and not far form the better known Jewish center of Satu Mare. 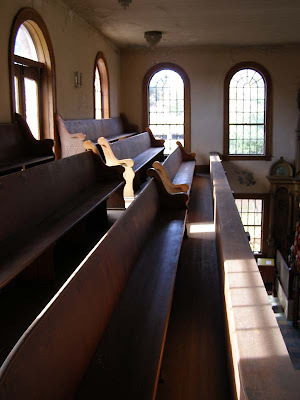 In 2008 American musician and photographer Yale Strom discovered a habd-notated volume of cantorial music amongst piles of unused prayer books stored in the women’s gallery of the former synagogue (given his discovery, Strom can perhaps be forgiven his trespass – for since the synagogue is kept locked, he broke in through a window). Strom made a copy of the volume (the original is now in the Carei archives), and from its melodies he has written a three part composition for string quarter that will performed this week at the Eldridge Street Synagogue in New York. The new musical arrangement doesn’t replicate the old, but it builds upon it. Strom dedicates the work, which he will perform together with the Mark Block Quarter, to those Jews who perished in the Holocaust. Following the performance Cantor Ari Priven of Congregation B’nai Jeshurun, will sing the prayers in their original form. Ruth Ellen Gruber has posted a brief report from the 2-day workshop on Jewish heritage in Lithuania that was held earlier this week in Vilnius. I was invited, but could not attend. We will see in time how much was accomplished, and how much was just. Despite a quick start in recognizing Jewish heritage sites - especially cemeteries and mas murder and grave sites - early in the 1990s, Lithuania has since lagged behind other countries in developing a coherent and effective policy to maintain and protect most of its historic Jewish sites. "a number of depressing factors, including vandalism, apathy, lack of coordination and cooperation between stakeholders, and the usual "one Jew building three synagogues on a desert island" syndrome. But the fact that the seminar took place was positive and I [Ruth] did learn some positive developments. 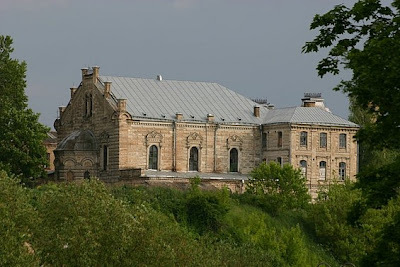 -- a grant from Norway through the EU has been obtained to start rebuilding the "red synagogue" in Joniskis whose eastern wall collapsed in a hurricane two years ago. 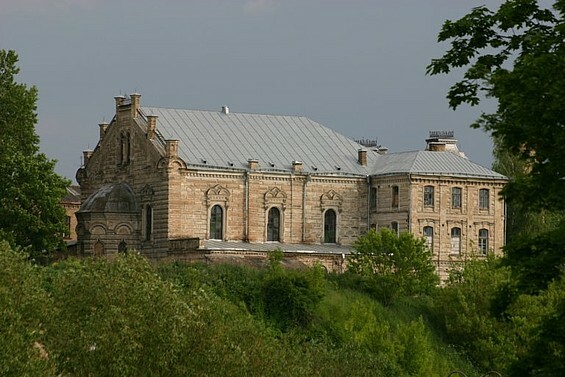 -- both the Culture Ministry and the municipality of Pakruojis are committed to restoring the wooden synagogue there, which was seriously damaged by arson earlier this year. Ruth Ellen Gruber has an good and instructive piece in the New York Times on the upcoming Hanukah festival in the Seventh (and Sixth) districts of Budapest. First time that this festival has expanded to include more than 30 local businesses, including clubs, pubs and restaurants and well as Jewish institutions. 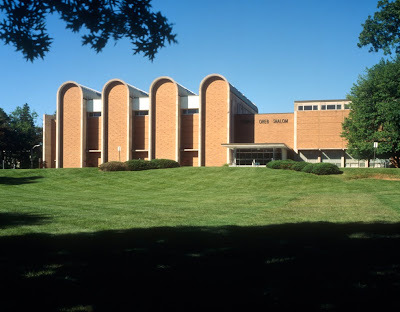 At a recent lecture that I gave I met architect Sheldon Leavitt, P.E., AIA, who I had previously known only as a name - the architect of record of Temple Oheb Shalom in Baltimore, designed and built 50 years ago (1956-60),and for which Walter Gropius was consulting architect. Leavitt told me something about the circumstances through which Gropius was engaged...and it was instructive for learning the reality of how modern synagogue architecture was sometimes developed - and still is. Baltimore, Maryland. 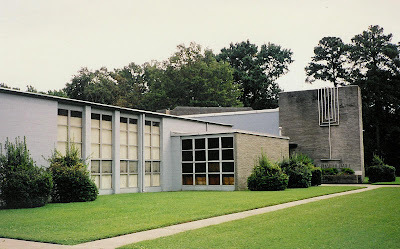 Temple Oheb Shalom (1956-60), Sheldon Leavitt, architect and Walter Gropius, consulting architect. Photo: Paul Rocheleau. Temple Oheb Shalom was set to build a new suburban home and Leavitt was engaged, but it was suggested - or requested - that he try to engage someone with a bigger reputation to consult to help fund raising. Aesthetics had nothing to do with it. Leavitt suggested Gropius, with whom he had recently worked on a project and the rest is history. Leavitt visited Cambridge, where Gropius was at Harvard, and the two spent time working on designs. 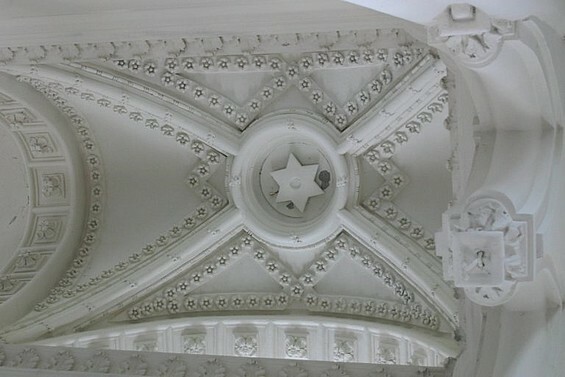 In the end the synagogue features and the functional aspects of the building were probably Leavitt's, since he knew the congregation and had already designed several other synagogues. The distinctive design features, however, especially four great barrel vaults that transverse the main block of the sanctuary, as well as the sanctuary floor that sloped up to the bimah; were Gropius's ideas. After a half century - and when asked on the spot - Leavitt couldn't quite recall. But I hope to interview him sometime soon to get more on this story, and to learn more of the collaborative process, but also more about his work on at least seven other synagogues which he told me about. All of these were built in the 1950s around the time of Oheb Shalom. Since that time his career took him in other directions - especially industrial, commercial, high-rise residential design. 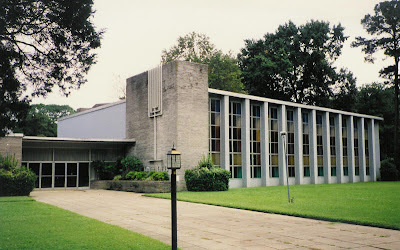 At that time Leavitt was almost as prolific a synagogue builder as Percival Goodman, another young American-born Jewish architect who championed modernism. Leavitt, much more than Goodman, leaned toward a functionalism in his work which demonstrated his training as an engineer. Mr. Leavitt holds a BSCE degree with high honors from the University of Illinois. Here is a working list of Leavitt synagogues. I have been able to pull together photos for some of them. His Gromley Chesed Synagogue in Portsmouth (1954), which I have not had a chance to visit, appears to be an especially handsome early modern structure. All need to be visited, described and fully photographed, and I expect this will be done as part of ISJM's modern American synagogue documentation project. Architectural historic Al Willis has already volunteered to document those synagogues in the Virgina Tiderwater region. Portsmouth, Virginia. 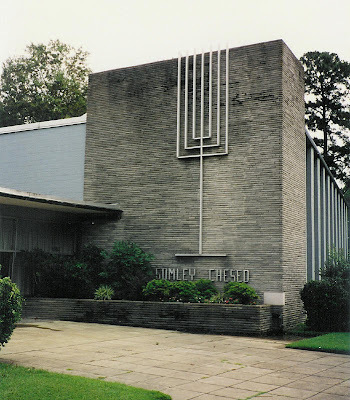 Gromley Chesed (1954), Sheldon Leavitt, arch. Photos courtesy of Julian H. Preisler. Norfolk, Virginia. 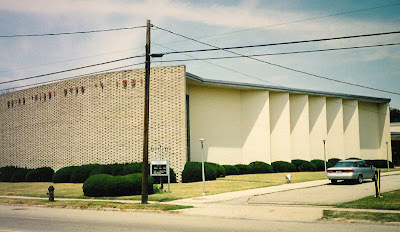 Temple Israel. Sheldon Leavitt, arch. (1953). Photo: Samuel D. Gruber, 2009. Cincinnati, Ohio. Former (?) 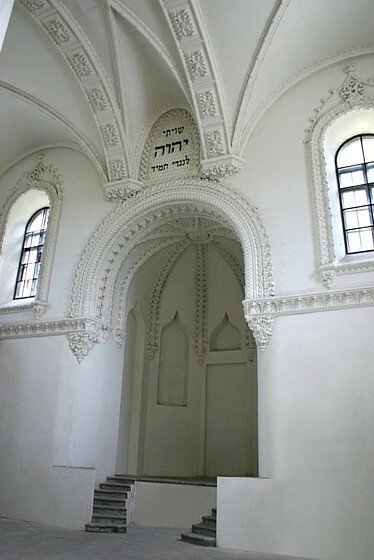 Ohav Sholom Synagogue. Sheldon Leavitt, Arch. (1957). Photos courtesy of Julian H. Preisler. Most of Leavitt's career has been as an accomplished engineer. Indeed, he was a Founding Fellow of the National Academy of Forensic Engineers, and is a Life Fellow of the American Society of Civil Engineers, and Fellow of the Architectural Engineering Institute of the ASCE, He founded Leavitt Associates in 1953, where he is still engaged, and where his son is a partner. 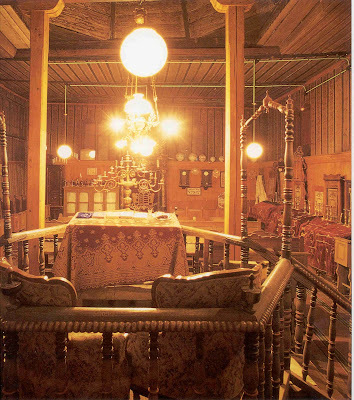 As a follow up to Monday's post about the completed restoration of the 19th century Baal Shem Tov Synagogue in Piatra Neamt, Romania, I post the above photo by esteemed architectural photographer Janos Kalmar (Kalmar photographed many of the synagogues of Central Europe in 1990s - these photos really needed to collated and published as a group). Also, I have learned that restoration of the synagogue was entirely organized by the Romanian Ministry of Culture, which allocated approximately 300,000 euro of government funds to the project from 19907 through 2009. The work was overseen by Romanian preservation architect Constantza Carp. The project got its start with a modest planning grant from the Jewish Heritage Program of the World Monuments Fund in 2001-2002. Unfortunately, given the state of the Romanian economy, we are not likely to see considerable spending on Jewish monuments - or perhaps any monuments - in the near future. Still, the situation for many historic and beautiful Romanian synagogues remains severe. Private funds are need for many worthy projects. For many other sites future use is uncertain, so preservation efforts are mostly postponed. 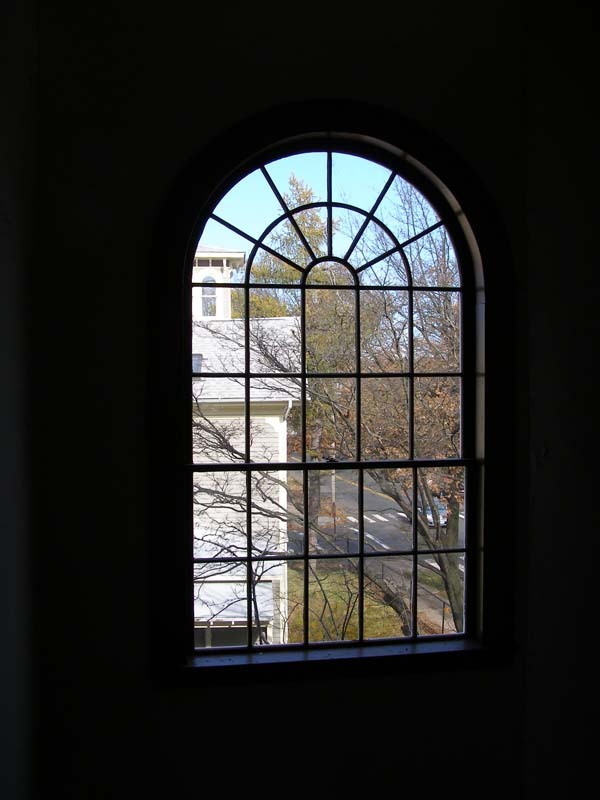 In some cases modest spending on building maintenance and security can protect them from more expensive repairs in the future. I welcome information about individuals, foundations, businesses, government agencies and organizations that would like to help. 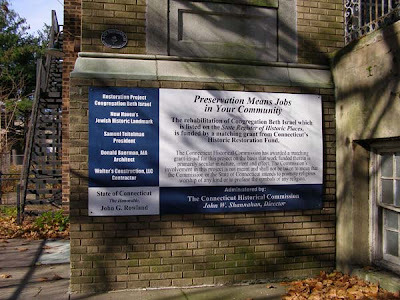 The International Survey of Jewish Monuments can make introductions to needy projects, or Gruber Heritage Global can provide more detailed and comprehensive planning and funding information. The Cathedral or “Baal Shem Tov” Synagogue of Piatra Neamt, Romania has been restored after an eight year effort, and will be re-dedicated on December 14, 2009, according to an announcement by Dr. Aurel Vainer, President of the Federation of Jewish Communities in Romania (FedRom) and of the President of Jewish Community of Piatra Neamt. The restoration of the historic synagogue is fittingly scheduled for Hanukah. The oldest surviving part of the synagogue complex was erected in 1766 and is listed as a State Historic Monument in Romania. It is the only surviving wooden synagogue in Romania, and was built utilizing the stone foundations of an earlier synagogue. 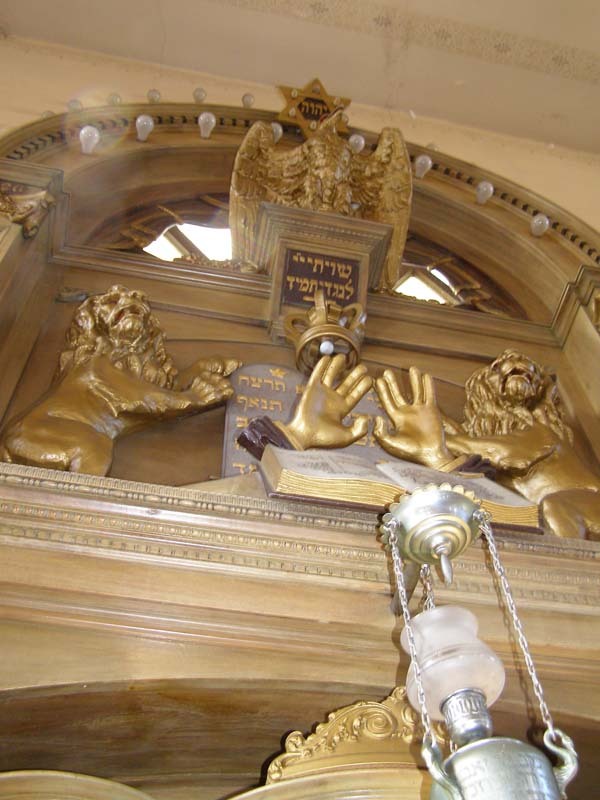 There are many stories and legends associated with the synagogue, many of which concern the Ba’al Shem Tov, the found of Hasidism, who local tradition relates lived for a time in the area and sometimes prayed (in the previous) synagogue. The simple square-plan timber building appears low from the outside, probably in order to conform to the heights of nearby buildings. 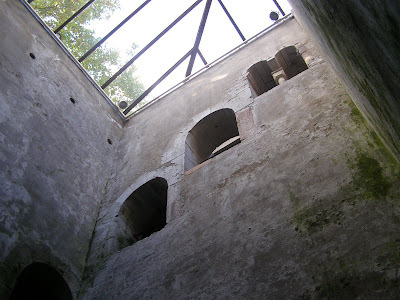 The sanctuary is reached by descending steps (from a later approximately 100-year old brick annex structure) to a floor 7.5 feet below ground level, allowing a much higher-than-expected interior (about 16 feet high), surmounted by a wooden ribbed dome. 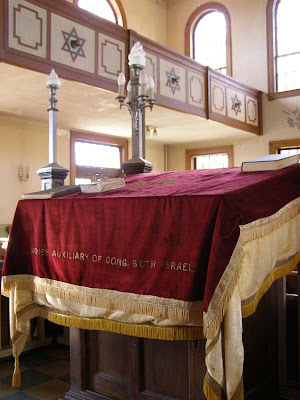 A free-standing octagonal bimah, under an oval canopy, is set in the sanctuary opposite the Ark, near the west entrance. A 2-level women’s gallery, actually a separate room, is on the north wall, and there is a one-level gallery on the west wall, above the entrance stairs. A space on the south wall is said to have been for children. 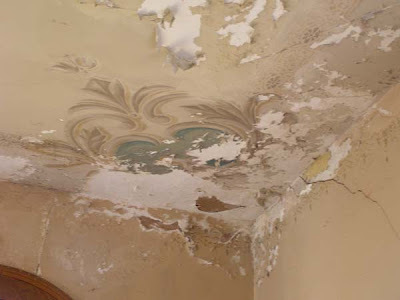 In 2001 the Federation of Jewish Communities initiated a restoration program for the synagogue, recognizing a number of serious problems including a damp and mold in the walls, a leaking roof, a wall off-axis, and a deteriorated floor and ceiling among other problems. The masonry synagogue also needed repair. It required the installation of an appropriate water-handling system, including roof replacement, as well a replastering and painting. 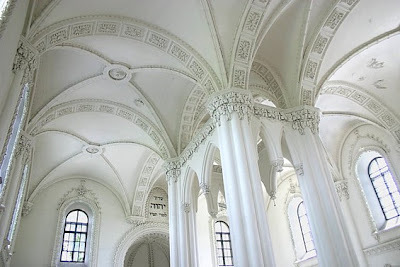 According to Ruth Ellen Gruber, who has visited the synagogue on several occasions: “Chandeliers hang from the ribbed wooded dome arching over the dull, brown-green walls decorated by pale stenciled flowers. Carved and gilded lions, griffins, bunches of grapes, and other decorations ornament the compact but elaborate Aron Ha Kodesh, built in 1835 by Saraga Yitzhak ben Moshe" (Jewish Heritage Travel, 2007, 269). Very close by is the larger masonry Great of Leipziger Synagogue, built in 1839 and rebuilt after a fire in 1904. I just learned this week of the recent death of Terri Trieger, on October 24, 2009. On behalf of ISJM, I send condolences to all of Terri's extebded family. Terri was curator for the Koslower Gallery at the Westchester Jewish Center, where she installed its first art exhibit, based on life cycle events and holiday ritual objects, in 1991. Many New Yorkers have known Terri, too, for her active role as a docent at the Jewish Museum in New York for four decades. Terri was also an advisor to the Judaic Museum of Riverdale Hebrew Home for the Age. 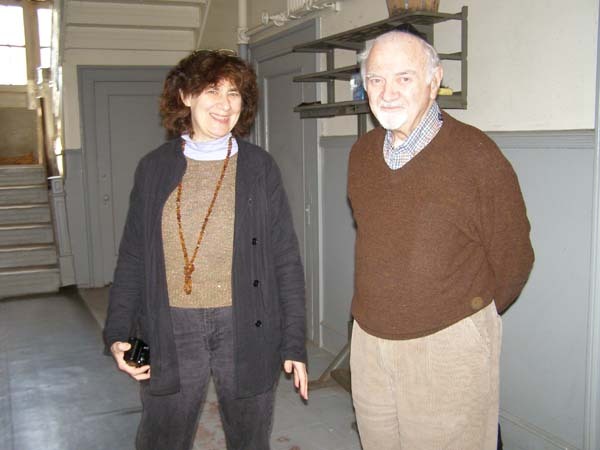 Terri worked with the International Survey of Jewish Monuments in 2005 to install and present an exhibition of Vincent Giordano's Before the Flame Goes Out at the Koslower Gallery, as a work in progress. Terri was a woman of tremendous energy, enthusiasm, experience and insight. She will be missed by all who knew her. 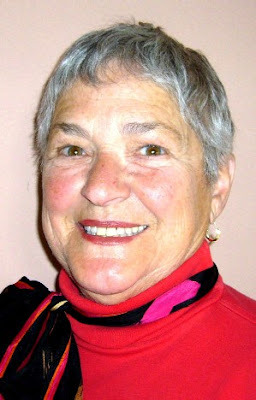 Terri graduated from Brandeis University in 1955. She is survived by her husband Dr. Norman Trieger, 4 children, 13 grandchildren, and 11 great grandchildren. Charitable contributions in her memory may be made to the Koslowe Gallery at the Westchester Jewish Center in Mamaroneck, NY. Her obituary in the Larchmont Gazette here.